"Bull markets are born on pessimism, grow on skepticism, mature on optimism, and die on euphoria." "A speculator is one who runs risks of which he is aware, and an investor is one who runs risks of which he is unaware." (3) Logic, Mathematics - a proposition that is assumed without proof for the sake of studying the consequences that follow from it. Whatever your market/life outlook, one thing is for certain, we do inhabit historically significant and trying times. While there are many political, social and international issues upon which to dwell, this article is neither the time nor place to discuss such issues. Nonetheless these issues/factors certainly can and do have a tangible impact on our investing behaviors. If marked on a 1 to 10 equanimity scale, whereby 1 is tranquil and 10 is October 2008 [or insert your own de facto crisis], today's current market certainly feels like it's an 8, in reality, it's more like a 4.5. Problem...this 4.5 marker has lasted the better part of 10 years. Over our emotional side's objections, feelings aren't facts; but hot damn do they cloud our judgement. If solid lines were the concrete parameters of markets, then feelings would be the Miro-esque paint strewn festively across its borders. Whereas Part 1 of this special series will focus on the major economic/governmental forces currently at play, Part 2 will focus specifically on how the current demand for multifamily, as an asset class, is a reflection of those dynamics. As stated in my previous post, Somewhere Between Manic & Awesome, "For those of us who have the good fortune of experience, the machinations of our current, QE induced market can be downright maddening." 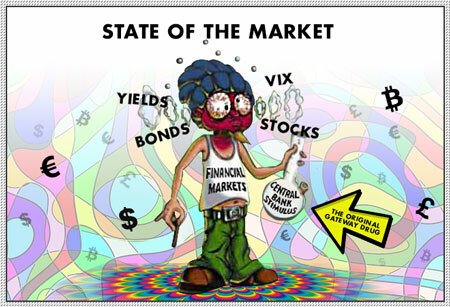 So confounding is the market that it often looks, and feels, like the cartoon to the right. Before we analyze the multifamily asset class, it is incumbent to look at the general market forces, as a whole, so as to quantify our starting point of 4.5 alluded to above. The most important of which I categorize as follows: (1) International Events – although not discussed, automatically recalibrates our risk tolerance levels, (2) Central Bank market meddling, (3) Rise of Quant/Passive Trading and (4) Death of Yield. While we can lament central banker meddling in the market via QE, NIRP, ZIRP and the like, it is the market in which all of us must play. Despite our own Federal Reserve's talk otherwise, coupled with the recent resignation of the Fed's No. 2, Stanley Fischer, I believe it is highly unlikely the Fed will continue with its interest rate hikes. Even if the Fed does surprise, like Canada's Fed, with a 25 to 50 bps rise we're still sub-2% with some 50%+ of the developed world's markets still operating in negative interest rates. Despite the fact that all I see are deflationary pressures, particularly in the near term, my inner Austrian economist screams in axiomatic fervor that by the very nature of our massive worldwide QE/NIRP/ZIRP experiment inflation lurks. The Swiss National Bank owns $85 billion of US equities. F' me. That's just absurd...I am amazed at how these Central Bankers can write billions of dollars of blue tickets, and we don't bat an eye [said another way, in 2017, alone, there has been $1.96 trillion of central bank purchases of financial assets]. 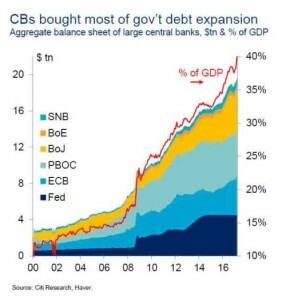 Central Banks are printing money out of thin air and buying stocks with it. Stop a moment and really take that in. Short term interest rates are negative in many parts of the developed world. Negative! How do you price equities with negative interest rates and Central Banks competing with blue tickets? 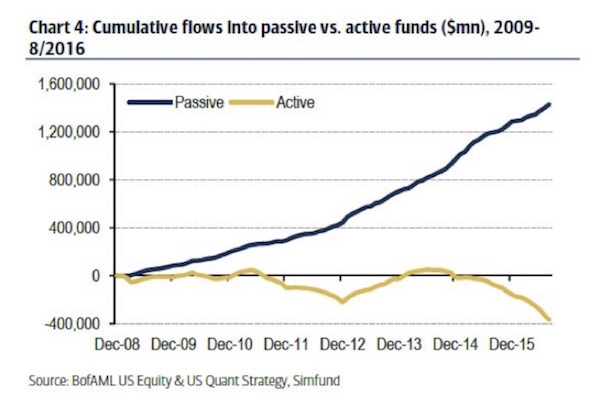 Two days ago, JPM's head quant made a striking observation: "Passive and Quantitative investors now account for ~60% of equity assets (vs. less than 30% a decade ago). We estimate that only ~10% of trading volumes originates from fundamental discretionary traders." In short, markets are now "a quant's world," with carbon-based traders looking like a slow anachronism from a bygone era. Despite my general aversion to passive investing is does lead me to the following questions: are quants better at creating more uniform markets than their carbon-based competitors or just better at trading central bank liquidity? If the former, what have we, as investors, given up in order to attain this seeming stability? If the latter, what happens when that liquidity disappears? 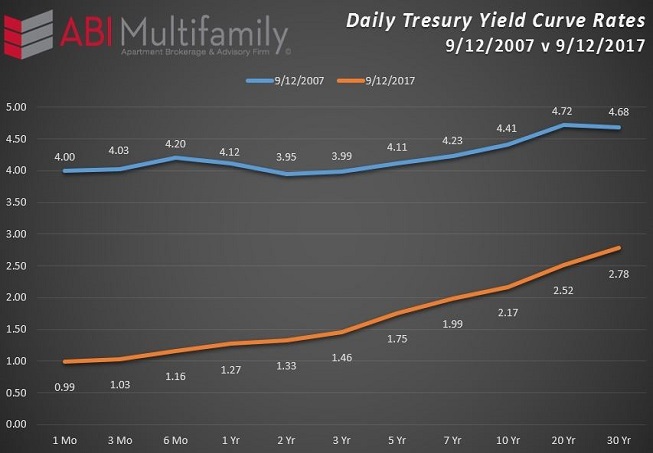 The destruction of yield, as reflected in the daily treasury yield rates (chart shown below), is one of the larger casualties of central bank NIRP/ZIRP policies which has had major market ramifications particularly in the fixed-income asset category. US Treasury bills are one the most liquid of the fixed-income instruments and basis for valuing/comparing other fixed-income instruments like bonds and corporate debt. Federal Reserve data shows that in 1952, the average public pension had 96 percent of its portfolio invested in bonds and cash equivalents. Assets matched future liabilities…. [by] 1992, fixed income and cash had fallen to an average of 47 percent of holdings. By 2016, these safe investments had declined to 27 percent. It's no coincidence that pensions' flight from safety has coincided with the drop in interest rates. That said, unlike their private peers, public pensions discount their liabilities using the rate of returns they assume their overall portfolio will generate. In fiscal 2016, which ended June 30th, the average return for public pensions was somewhere in the neighborhood of 1.5 percent…. Given the market dynamics listed above, investors the world over, are increasingly on the hunt for stable yield/income producing assets. In the US, we now find ourselves at the epicenter of the Boomer retirement boom and nearing it for the boom from Millennials; both of which have tremendous implications for housing and the overall investment market. It is my contention that multifamily, due to changing demographics, attractive cash flows and inherent hedge against the backdrop of longer term inflation, will be the asset du jour in the years to come. In Part 2 we will deep dive into the specific market, and investor, forces currently influencing the multifamily asset class and those most likely to propel it into the future.